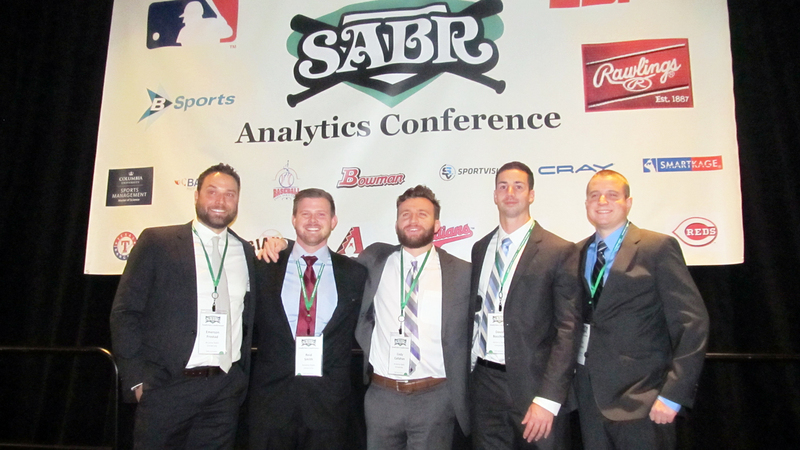 The 2015 Diamond Dollars Case Competition winners were announced Thursday, March 12 during the SABR Analytics Conference at the Hyatt Regency Phoenix in Phoenix, Arizona. A team from Arizona State University won the Graduate and Professional School Division. The team consisted of Sean Aronson, Emerson Frostad, David Bocchino, Reid Smith, and captain Cody Callahan. In the Undergraduate Division, the winning team was from Stanford University. Stanford's team consisted of Avner Kreps, Vihan Lakshman, Do-Hyoung Park, Alec Powell, and captain Jordan Wallach. "The judges thought the results were very impressive … in the complex way these students are processing this data," said SABR President Vince Gennaro, who develops the case studies in the Diamond Dollars Case Competition. The runner-up in the Graduate and Professional School Division was Ryerson University (captained by D'arcy Mulligan). The runner-up in the Undergraduate Division was Tufts University (Team 2, captained by Caleb Pykkonen). In this year's case, students were asked to determine the best possible trade package for Philadelphia Phillies star left-hander Cole Hamels in terms of present and future value to both teams involved in the deal. In the Diamond Dollars Case Competition, undergraduate, graduate and professional school students from colleges and universities across the country compete against each other by preparing an analysis and presentation of a baseball operations decision — the type of decision a team’s GM and his staff is faced with over the course of a season. The cases are developed by Gennaro, author of Diamond Dollars: The Economics of Winning in Baseball, and consultant to MLB teams. The Diamond Dollars Case Competition is the first national competition to be based solely on baseball operations issues. Four- to five-person student teams are asked to evaluate a baseball operations case problem. The student team presents their analysis and recommendations to a panel of judges that includes MLB front office executives. This year's judges were Peter Bendix, Tampa Bay Rays; John D'Angelo, MLB; Sarah Gelles, Baltimore Orioles; Yeshayah Goldfarb, San Francisco Giants; Ed Lewis, Arizona Diamondbacks; Reed MacPhail, MLB; Samuel Mondry-Cohen, Washington Nationals; Matt Obernauer, Colorado Rockies; Dane Sorensen, St. Louis Cardinals; Scott Spratt, Baseball Info Solutions; Victor Wang, Cleveland Indians; and Keith Woolner, Cleveland Indians. Other participating schools in the Graduate and Professional School Division were: University of Alabama-Manderson School of Business; Carnegie Mellon-Tepper School of Business; University of Chicago-Booth; DePaul University; University of Nevada at Las Vegas-Lee Business School; Pepperdine University-Graziadio School of Business and Management; University of San Francisco; and Stanford University. Participating schools in the Undergraduate Division were: University of Colorado-Leeds School of Business; Elon University; Loras College; NYU-SCPS Tisch Center; Ohio University; St. John Fisher College; Syracuse University; Tufts University (two teams); and VCU-Maggie L. Walker Governor’s School. A record 21 colleges and universities participated in the 2015 Diamond Dollars Case Competition. 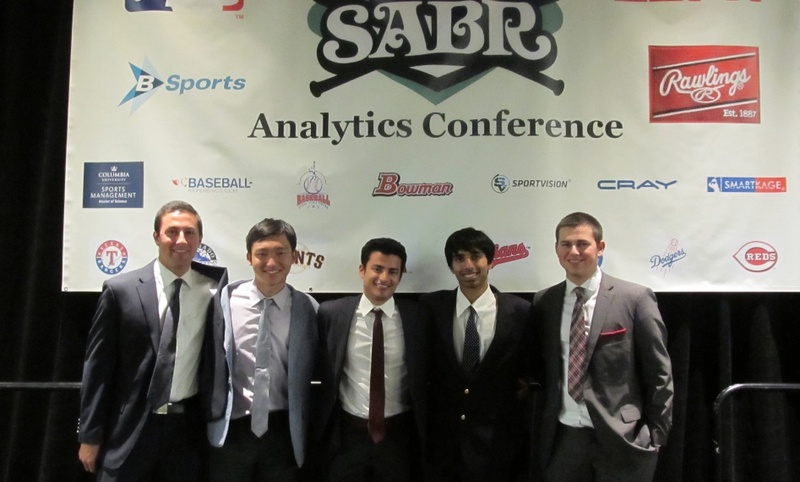 For more coverage of the 2015 SABR Analytics Conference, visit SABR.org/analytics/2015. Related links: To learn more about the 2014 Diamond Dollars Case Competition winners, click here. Six alumni from the 2012 and 2013 Diamond Dollars Case Competitions have secured internships or permanent positions within Major League Baseball. For more information on entering the Diamond Dollars Case Competition, contact SABR President Vince Gennaro or click here for rules and entry requirements. The Graduate and Professional School Division will present in the Remington and Phoenix Ballrooms. The Undergraduate Division will present in the Borein and Russell Ballrooms. Opening Remarks by Vince Gennaro, 8:30-9:00 a.m.
Carnegie Mellon-Tepper School of Business (Pittsburgh, PA), 9:00-9:30 a.m.
University of Alabama-Manderson School of Business (Tuscaloosa, AL), 9:35-10:05 a.m.
University of Chicago-Booth (Chicago, IL), 10:10-10:40 a.m.
DePaul University (Chicago, IL), 11:00-11:30 a.m.
Ryerson University (Toronto, ON), 11:35 a.m.-12:05 p.m.
Stanford University 1 (Palo Alto, CA), 9:00-9:30 a.m.
University of San Francisco (San Francisco, CA), 9:35-10:05 a.m.
UNLV-Lee Business School (Las Vegas, NV), 10:10-10:40 a.m.
Arizona State University (Tempe, AZ), 11:00-11:30 a.m.
Pepperdine-Graziadio School of Business and Management (Malibu, CA), 11:35 a.m.-12:05 p.m.
Syracuse University (Syracuse, NY), 9:00-9:30 a.m.
Stanford University 2 (Palo Alto, CA), 9:35-10:05 a.m.
Tufts University 1 (Medford, MA), 10:10-10:40 a.m.
University of Colorado-Leeds School of Business (Boulder, CO), 11:00-11:30 a.m.
Elon University (Elon, NC), 11:35 a.m.-12:05 p.m.
Ohio University (Athens, OH), 9:00-9:30 a.m.
VCU-Maggie L. Walker Governor’s School (Richmond, VA), 9:35-10:05 a.m.
NYU-SCPS Tisch Center (New York, NY), 10:10-10:40 a.m.
Tufts University 2 (Medford, MA), 11:00-11:30 a.m.
St. John Fisher College (Rochester, NY), 11:35 a.m.-12:05 p.m.
Loras College (Dubuque, IA), 12:10-12:40 p.m.